As we enter the final week before 256 FIFA players from around the world compete at the $1 million Challenge Series finals in Las Vegas this Saturday, our partners at Virgin Gaming have provided Player Profile Cards for FIFA Challenge Finalists! While they didn’t get every finalist, they did get quite a few. 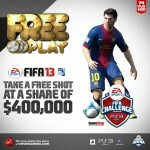 Get your downloadable Player Profile Cards for FIFA Challenge Finalists here. We will keep you updated all week as news unfolds in the build up to the year’s biggest FIFA tournament. Good luck to all those attending and we hope you have an amazing time out in Vegas. So who is your favourite to win it this year? Vote in our question on our Facebook Fan Page to see who is the pre-tournament favourite.